Welcome to the Children’s Literacy and Reading News roundup … While I have been traveling back in time to 1609 (Jamestown) and 1775 (Williamsburg), searching to find who wanted to kill General George Washington, Carol Rasco of Rasco from RIF and Jen Robinson of Jen Robinson’s Book Page have found lots of great news in the world of children’s literacy and reading. Jen and Carol have lots of wonderful news to share so if you haven’t already, hop over to Carol’s Roundup of Children’s Literacy and Reading News – March in Review and Jen’s roundup, also titled Children’s Literacy and Reading News Roundup: March in Review. Like Jen, I found Teri Lesesne’s post Reigniting the Passion for Reading (Stenhouse blog) a wonderful read. It is the third in a series of posts Teri wrote about her reading journey and “paying forward” a love of reading with kids. You’ll likely recognize yourself in one or more of her seven tips and find her solutions to the “reading duldrums” easy to do! Carol also asks and answers the question “Fiction or Nonfiction?” by leading us to several articles and studies about why readers need both types of material, and how each plays a role in getting kids excited about reading. Like Carol, I am very excited about the wonderful nonfiction for kids. 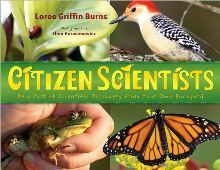 Did you happen to see the review of Citizen Scientist by Loree Griffin Burns in the recent issue of Curriculum Connections (a School Library Journal newsletter)? It is now on my TBR pile, as I love any book that “offer students an opportunity to become active investigators.” I suspect that we could see this among the Cybils nominees in the nonfiction picture book category this fall. As you may remember, we kicked off a literacy-filled March by celebrating Dr. Seuss’ birthday (aka Read Across America Day). But did you know that Dr. Seuss’ alma mater, Dartmouth University, is renaming its medical school? The Dartmouth Medical School (fourth oldest medical school in the nation) has a new name: the Geisel School of Medicine. The change honors Audrey and Theodor Geisel. Theodor “Ted” Geisel, a member of the class of 1925, “better known to the world as legendary children’s book writer Dr. Seuss.” Read the full article in The Dartmouth Review. I will be back in the next week or so with a report (or two) from my days in the 18th Century and some more timely news for a mid-month roundup of children’s literacy and reading news. Whether you are celebrating Passover, Easter, spring, or a bountiful basket of poetry! I wish you a wonderful weekend! I can’t wait to hear all about your crawl back through history…what fond memories you have evoked for me mentioning this week’s history crawl as I remember coming to this coast from Arkansas with my daughter more than once to visit these wonderful places! Thanks for your great additions to the Roundup, have a wonderful weekend!